I customize the Windows desktop by color for the different machine types i.e. Active Directory, Exchange 2007, and XP client. When I view the Windows Machines via the ESXi VSphere client console, all color schemes are correct. When I access the same machines via remote desktop the unique desktop color does not appear. All desktops default to blue and the ability to customize Display Properties --> Background is not accessable. Is this normal behavior for an ESXi host accessed via remote desktop? Is there a work-around to get the desired color scheme to show? 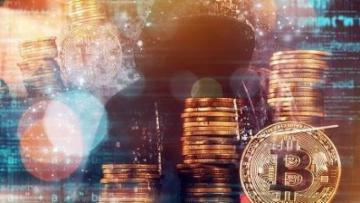 It's nothing to do with VMware ESX, it's RDP, do you have the options turned off? I would check the remote desktop connection settings. I have custom backgrounds that show for me in Servers that I rdp to that are running in an ESXi vSphere environment. 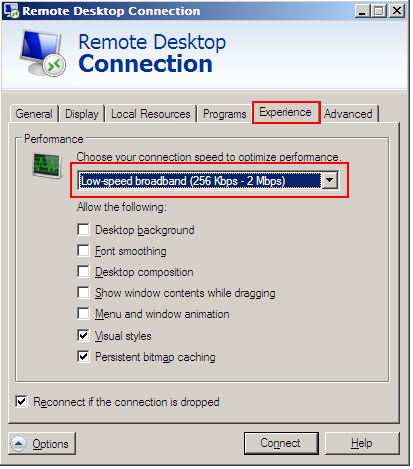 The Experience tab of the Remote Desktop application has this option, you can customize it depending on your bandwidth. Select LAN (10 Mbps or higher) for full desktop experience. Getting closer with the solution due to your help. Changing the RDP setting to LAN did the trick when connecting to the XP ESXI hosts. Saw the exact desktop color, icon arrangement, and BGInfo detail. However, for the Windows 2003 ESXi hosts when using RDP I did not see the BG Info detail. Also the icons were arranged differently when comparing the view to Vsphere client console. I believe I am on the correct desktop. because I added a new text document to the desktop from the RDP connection and it displayed when I accessed the host form the VSphere ESXi console. Any suggestions are appreciated. 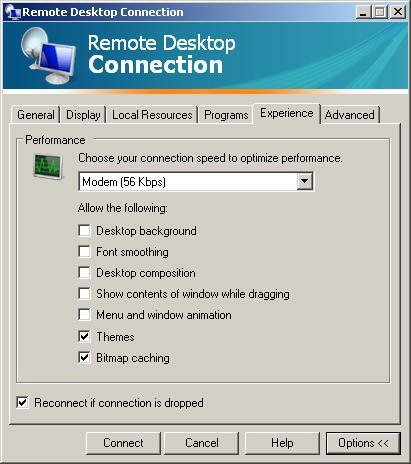 Below is a screen shot of my RDP settings. Thanks again :). They should be the same, however, from vSphere Client Console view is a view from the console (obviously) as if, you were logged in on the console of a physical server, using a keyboard and mouse. RDP is a terminal sever connection, unless you specify to Connect to the Console. Have you tried connecting to the console via RDP, to see if the display is the same? mstsc /v:<servername> /admin will work on RDC (RDP) v6.0.6001. this will connect you to the same Console thaty vSphere GUI "sees"
There is an option in later versions in the GUI. Thank you for all of you help in solving the problem. Your expanations were great! The final piece ofd the puzzle was changing the BG Info default settings to update desktop.